Maymo the beagle, like The Dude, abides. Meet Maymo the Lemon Beagle, a dog whose head-balancing skills put circus performers and finishing school debutantes to shame. Put any random item on Maymo’s head and he will work it like Miss J on America’s Next Top Model. Just over a week ago, Maymo posted a 100 second video balancing 100 difference fruits and vegetables on his head. 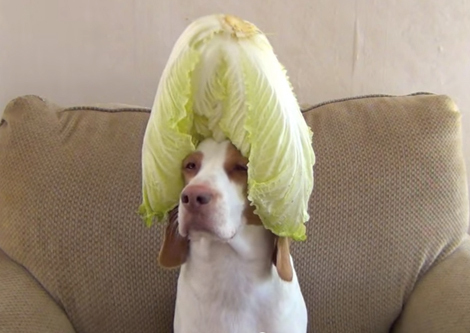 We’re talking serious 2 and 5 millinery, including a coconut, Napa cabbage and a whole pineapple. 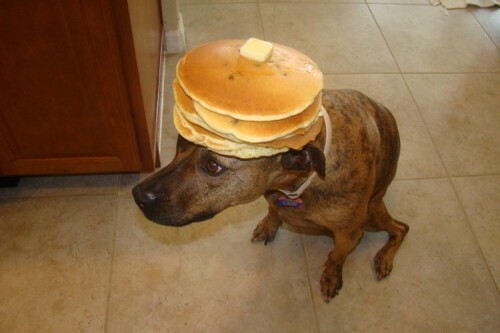 We haven’t seen this kind of canine stoicism since Tiger, the Staffordshire Terrier and supermodel star of the Food on my Dog tumblr, let his owner stack pancakes on his head like it was race day at iHop. Watch the video above for your daily dose of vitamins, minerals and cuteness.